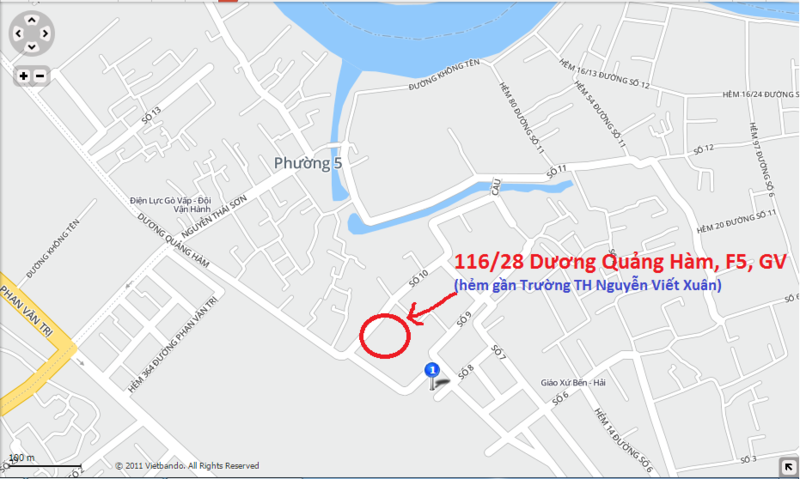 Bán Laptop có cổng COM cho dân kỹ thuật HCM. HP Probook 6560b cổng COM I5-2520M, ram 4G, HDD 500G, màn hình 15 inch, có VGA rời, có cổng COM kết nối CNC. Bảo hành 3 tháng. Heavy metal reloaded. 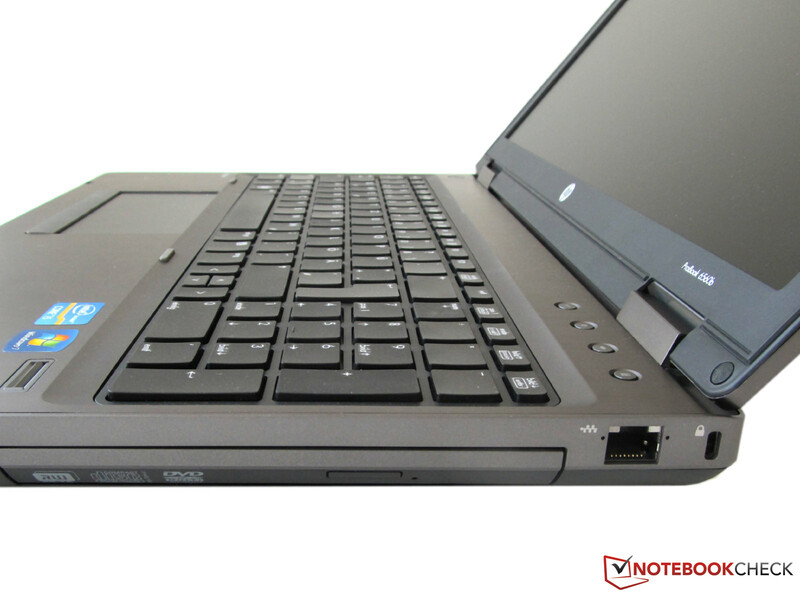 The ProBook 6560 LG658EA is an entry level business device from Hewlett Packard in a robust aluminum case. In addition to its high-end looks, the installed hardware is also impressive: a dual core CPU from Intel's second generation processors, dedicated AMD graphics and a 15.6 inch matt display with a high resolution. Price: about 900 euros. 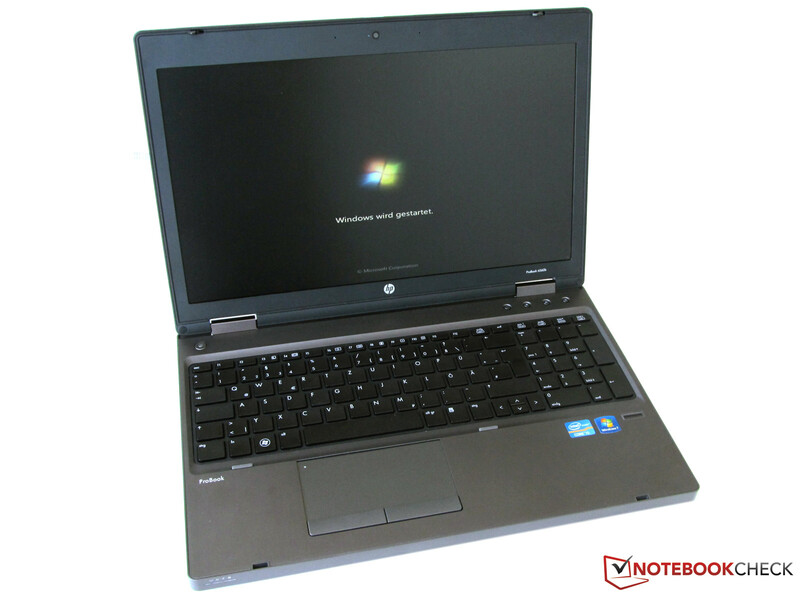 The ProBook 6560-LG658EA is a 15.6 inch laptop from Hewlett Packard that is equipped with special business features. Not only the inner values count to this, but the modern design as well. The display bezel is made of pearl blasted aluminum. The case is additionally reinforced with magnesium. The 39.6 cm HD display (15.6 inch) in a 16:9 format can reproduce a resolution of 1600x900pixels. Thus, it is also perfectly suitable to work with several adjacently opened windows. An Intel dual core CPU, model Core i5 2520M, works inside the entry level business laptop. It runs with a clock rate of 2.5 GHz and can even overclocksingle cores up to 3.2 GHz thanks to the Turbo Boost technology. Besides the incorporated Intel graphics, this notebook also has a dedicated graphics card from AMD. The Radeon HD 6470M supplies its own video memory of 512 MBs. Moreover, a 500 GB hard disk, a DVD burner and 4 GB of RAM are installed. HP has also integrated WWAN (3G) and a 56k V9.92 modem next to WLAN, Bluetooth and Gigabit LAN for connectivity in our test model. The HP ProBook's case is a treat in terms of looks. On top of that, a solid notebook is created by the used materials. The case's workmanship is excellent and is continued over the entire device. The reinforced magnesium chassis however also has a drawback. The laptop is almost at the absolute limit of acceptability in terms of portability with 2.9 kg. You notice every gram of your HP ProBook when it's carried around. The dimensions of 37.4 cm x 25.1 cm x 3.4 cm are also peak values for a laptop of this device category. The model, 6460b (review will follow soon), might be of interest in case of high demands on portability. It is more compact with its 14 inch screen and thus a bit lighter. The aluminum case should be resistant against vibrations and other environmental influences. Unfortunately, you'll soon find your fingerprints all over the platinum colored case. The case's lid, where the 15.6 inch screen is inserted, can also be opened with only one hand. However, you need quite a lot of strength because the HP ProBook's new hinges are still very stiff. The case's closed lid is tightly fastened to the rest of the laptop by two, securely grasping transportation hooks. The HP ProBook not only has a lot to offer on the inside that is not found in every notebook's basic configuration, but also on the out. Three USBs, 1 IEEE1394 (FireWire), 1 eSATA/USB combo and a serial interface belong to that. Regrettably, the laptop doesn't have a USB 3.0 port. Furthermore, the device has a card reader for SD and MMC memory cards. There is also a PC ExpressCard54 slot on the case. Both a VGA and a display port are available for video transmission to an external screen. The interfaces are well distributed on the notebook's sides. Nevertheless, both sides of the ProBook 6560b-LG658EA don't look overloaded despite the vast amount of jacks and interface options. Positive: the LAN port, power socket and DVI port have been placed on the rear edge. Thus, the majority of occupied ports can be led directly to the rear even without a docking station and don't get in the way beside the device. There is also a port for an optionally available docking station on the device's bottom. It costs about 220 euros and has additional 4 USB ports, a display port, a DVI and VGA out. It is definitely worth considering if you frequently switch between office and portable use. The ProBook has several options for connecting to the company network or Internet available right away. For one thing, the 10/100/1000 compatible LAN socket and for another wireless LAN standard IEEE 802.11 b/g/n. 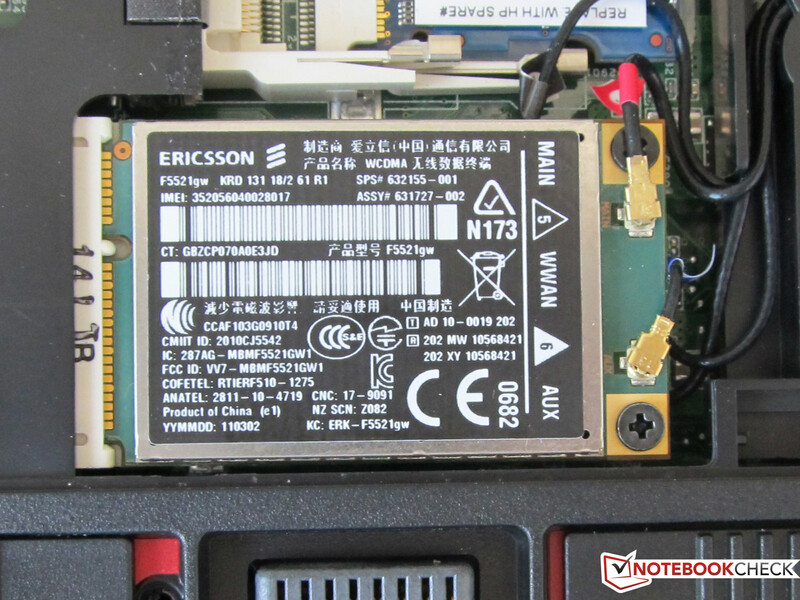 Besides that, our configuration of the ProBook has Bluetooth 2.1 EDR, a 56k modem and a 3G compatible WWAN module. The HP ProBook is equipped with many security functions. Among them: HP ProtectTools, TPM Embedded Security Chip 1.2, Enhanced Pre-Boot Security, HP Disk Sanitizer, hard disk encryption for HP ProtectTools, Credential Manager for HP ProtectTools, File Sanitizer for HP ProtectTools and a slot for a security lock (Kensington lock). The security tool, HP Spare Key, isn't pre-installed, but can be installed subsequently upon customer's inquiry (bypassing passwords with personal questions). The ProBook 6560-LG658EA also has a fingerprint sensor that allows the user to log into the system if this function has been enabled. HP optionally offers HP Computrace Pro (locating a stolen product) and a smart card reader. 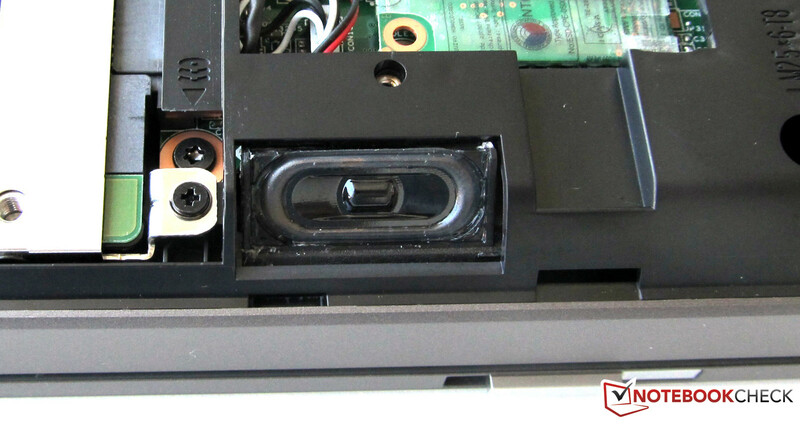 The latter replaces the ExpressCard slot. HP restricts itself to the most necessary in terms of included supplies. Apart from a few leaflets and various CD media, you'll only find the power adapter next to the laptop. The operating system, Windows 7 Professional 64 bit, is already installed. Installation DVDs can be created via software on DVD or CD media over the internal DVD burner. There is quite a bit of software installed on the ProBook in its state of delivery. For example, Microsoft Office 2010 that is only useable to an extent without a license. Also, Norton Internet Security 2011 with a 60 day trial period. You have to buy a license or live without the latest updates, or use different software after that. Roxio Secure Burn is on the hard disk for burning DVDs. The laptop comes with a 12 month warranty. It can be expanded with an optionally available and fee-based onsite service warranty extension. An extension of up to 5 years including onsite service is possible with the HP Care Packs. The QWERTZ keyboard is, like in its bigger brother the Elitebook 8560b, an eye catcher. The single keys of the spill proof keyboard stand alone and can be used easily. Besides the actual keyboard, there is a separate number pad that is very useful particularly in the business field. 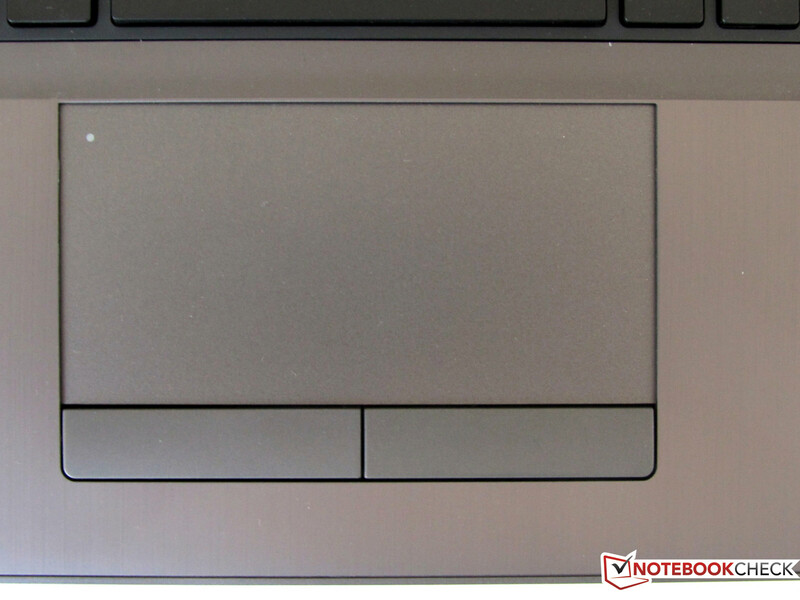 As in the Elitebook 8560p-LQ589AW, the four arrow keysare very small and are on the same level as the other keys on the keyboard. HP has restricted itself to the most important keys in the layout. The number of FN key combinations is kept within limits. A fairly big touchpad is in front of the keyboard. It supports multi-touch inputs and gesture control. It also has an area that can be used for 2 way scrolling. Both mouse keys are in front of the touchpad. There is an almost invisible dot in the touchpad. The touchpad is disabled when it's double clicked with a finger. It is a practical innovation for prolific typists, who don't always want to follow the cursor on the screen. An LED signalizes the touchpad's offline mode. A double click in the area reactivates the touchpad. The 110x57 mm touchpad area's gliding traits is very good. HP has built in a 720p webcam above the HD display. It allows pictures and videos to be transmitted via Skype or other messenger programs. The HD+ display has a resolution of 1600x900 pixels. The business notebook from HP's ProBook 6560b range is equipped with a 15.6 inch LED screen that can display a maximum HD+ resolution of 1600x900 pixels. The display surface is matt and prevents reflections in everyday office surroundings. In addition to the processor's integrated Intel HD Graphics 3000, an AMD Radeon HD 6470M is also responsible for video output. Additional, external monitors can also be connected to the screen via VGA and display port so that the notebook can be used as a multi-display workplace in the office. The matt screen and the good average brightness of 206 cd/m2 provide the basis for use in the office field. The measured black value is 0.3 cd/m2 at a pleasing contrast ratio of 693:1. The HD display's color spectrum is narrow though. AdobeRGB (t) is clearly failed. The comparisons with sRGB (t) or Apple RGB (t) don't show quite as big difference, even if a complete coverage can't be granted. 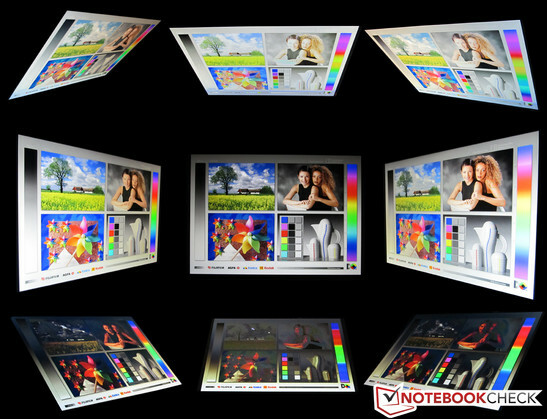 The matt display loses its indoor advantage in outdoor use. The color intensity and the good contrast no longer exist in direct sunlight. The colors fade and the screen's content is harder to see. Displayed content can also only be seen with more effort even on the highest brightness level (see picture). That means that working outdoors is only possible in the shady beer garden. Overall, a higher display brightness would have been desirable in this case. 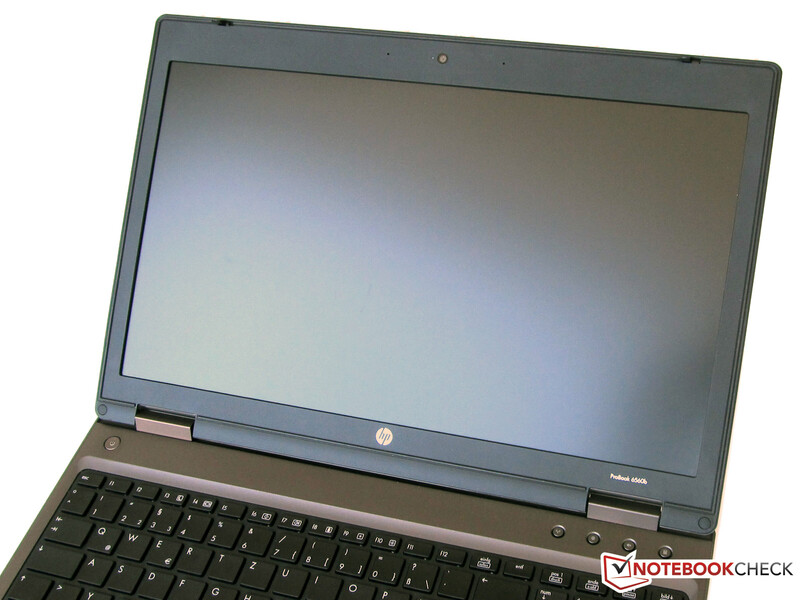 The HP ProBook 6560p-LG658EA couldn't really convince in terms of viewing angles. The colors and contrast are good in an optimal nearly perpendicular viewing angles, but they loose on brilliance already at slight deviations. A lateral viewing angle (right and left) of up to 45 degrees is still acceptable. The picture inverts, respectively fades almost beyond legibility at the same time when the display is tilted up or down. 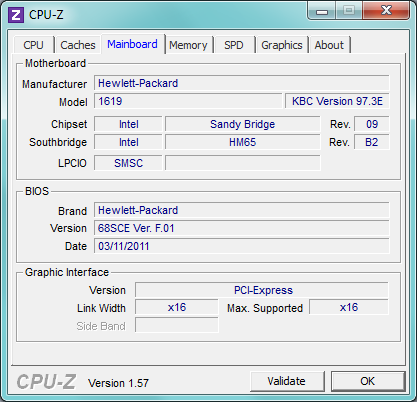 An Intel Core i5 processor from the Sandy Bridge generation is used in the HP ProBook 6560b-LG658EA. 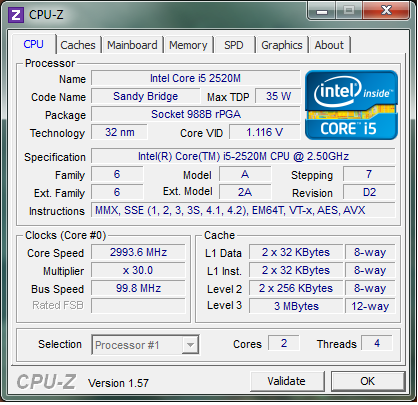 The dual core CPU (Intel Core i5-2520M) works with a base clock of 2.5 GHz. The number of computing cores is virtually doubled (4) thanks to Hyper Threading support. 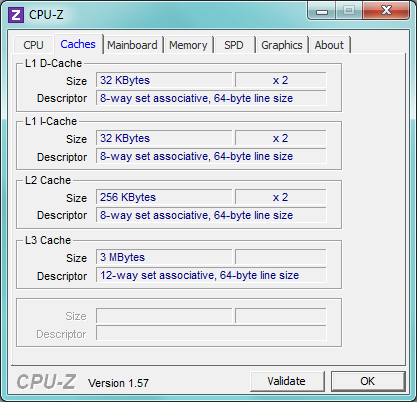 The CPU is automatically clocked up to 3.2 GHz by the Turbo Boost mode when required. The processor has a 3 MB level 3 cache and is produced in the 32 nm technology. The Sandy Bridge dual core processor also includes the incorporated DirectX 10 capable Intel HD Graphics 3000 graphics card and the memory controller in the specified TDP of 35 watts. Besides the CPU's HD graphics, a dedicated graphics, model AMD Radeon HD 6470M, is also used in the ProBook. The 2520M CPU's maximum clock rage of up to 3.2 GHz also remains stable during load (Cinebench's single CPU rendering). That means it exploits its turbo reserves well. The CPU's clock stayed constant at at least 2.5 GHz in our simulated stress test over 180 minutes – both Prime and Furmark ran simultaneously. Turbo also pushed the CPU rate to its limits of 3.2 GHz in the first few minutes. The hotter the die temperature got, the less "turbo" was used. However, the Intel Core i5-2520M 's clock rate never fell below 2.5 GHz, so the specified base clock of all cores, during load. The achieved results in the Cinebench R10 benchmark tests are within the expected range for the used CPU in both the single core as well as in the multi core rendering test. This laptop was no exception and had to run through many tests in the benchmark marathon. The total package (CPU, GPU, memory and hard disk) are assessed with cross component test tools, such as PCMark05, PCMark 7 and PC Mark Vantage. Moreover, the notebook had to endure a few synthetic benchmarks, among others from Futuremark. These test tools specify just how fast the laptop's graphic functions are. This is only secondary in a business notebook, but this point shouldn't be underestimated. In particular since many applications can benefit from the resources of a dedicated GPU. The device achieved a score of 7680 points in PCMark Vantage. Thus it is in the upper range of all notebooks that we have tested without a built-in solid state drive (SSD). Our experience shows that they would push the total score to over 10000 points. This would also be a possibility for the user to increase the 6560b's application performance considerably after buying. In comparison, the HP Elitebook 8460p (2620M/HD6470M) places itself insignificantly higher, the workstation from the previous Elitebook generation, the 8540w (620M/FX880M) lags even slightly behind with 7510 points. We also check the performance reserves of the installed AMD Mobility Radeon HD6470M graphics card in the framework of our benchmark range. Our test configuration achieved 5064 points in 3DMark 2006 and thus places itself amidst comparably equipped laptops. Dell's Vostro 3350 (2620M/HD6470M) manages a slightly better result with 5476 points. The Elitebook colleague, 8560p with a 2540M CPU and the same graphics chip, even comes very close with 5027 points. Overall, the AMD HD6470M graphics card is about in the range of the GT520M or GT525M graphics chip from the competition, Nvidia, and is overall sooner in the entry level field. In comparison: Intel's installed HD Graphics 3000 can achieve up to 3500 points in 3DMark 2006. The graphics card also performs typically in the executed 3DMark11 benchmark test. The dedicated graphics chip not only bestows the user with added value, due to a moderate performance increase in comparison to the built-in Intel solution. It also supplies a variety of GPU incorporated features, such as UVD3 Video Decoder, Eyefinity (up to 4 monitors can be controlled) or support for other calculations thanks to DirectX 11, OpenGL 4.1, DirectCompute 11 and OpenCL. A Western Digital WDC WD5000BEKT with a gross memory capacity of 500 GB is installed as the hard disk. The hard disk has a size of 2.5 inches and the internal disks rotate with 7200 rpm. The average transfer rate is 81.3 MB/s, established with HDTune. 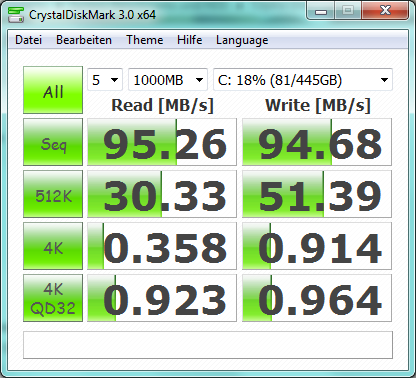 CrystalDiskMark 3.0 could even evoke 95 MB/s from the Western Digital disk. The burst rate was 143.2 MB/s at a CPU capacity of 2.3 percent in the test. The good access rate of only 16.1 milliseconds was also striking. Thus, the hard disk's rates were overall convincing. It was also confirmed by other test tools from the PCMark series and is responsible for the good results to a large extent. This laptop's strengths are clearly found in other fields. However, the business customer might want to play an occasional game sooner or later. Nevertheless, the HP ProBook 6550b-LG658EA doesn't exactly mutate to a gaming notebook with the Radeon HD 6470M graphics card. We tested a few of the latest games on the HP notebook for comparison. Which games run on this graphics chip can be found in our comprehensive database "Computer Games on Laptop Graphic Cards". The measured rates were all on the expected level. The noise development is dependent on the notebook's use. The fan works within a reasonable range in idle mode with 32.2 dB (A). 32.2 dB (A) is only perceived as a quiet noise in a normal office environment. This level might be found as a bit disturbing in a quiet living room over a longer time. It gets even slightly louder when rendering a DVD. We could measure 34.6 dB (A) in this case. Fortunately, the corresponding volume goes hand in hand with watching a DVD in most cases. It should be able to drown out the drive easily. We recorded the maximum rate with 40.2 dB (A) during full load (100% CPU and GPU). In view of this unrealistic extreme situation, the ProBook does a throughout good job here as well. The HP ProBook 6560b-LG658EA's fan was always audible in the numerous tests, but it was never seen as disturbing. The HP ProBook 6560b-LG658EA remains cool in idle or during light office tasks, as expected. The top's temperatures have a maximum of 26.5 degrees Celsius. The notebook's bottom gets a bit warmer with good 30.1 degrees Celsius. 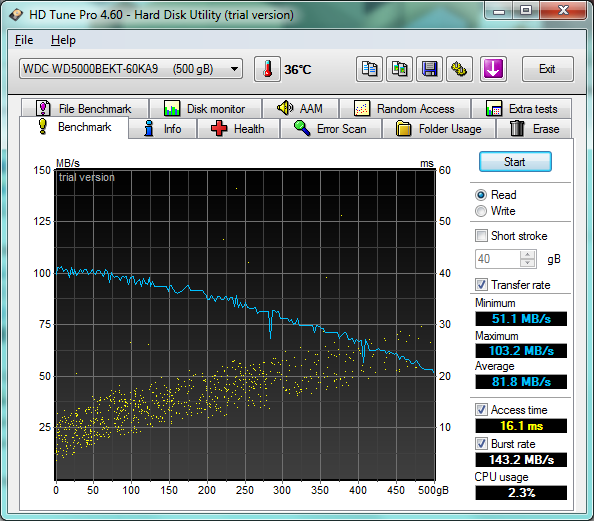 The HP ProBook's temperatures first increase significantly during load (stress test). However, the temperatures in the wrist-rest area only climb by good 2 degrees Celsius. The bottom gets a bit warmer. The temperatures climbed to nearly 37 degrees in the areas where the fan's heatpipe does its job. The notebook could still be used on the lap even during the stress test without hesitation. The power adapter also got warmer during the stress test. The measured rates were between 36.3 degrees Celsius (idle mode) and 54.1 degrees Celsius during load in the test. The ProBook has two small stereo speakers for sound rendering. They are located underneath the case. The sound is satisfactory in normal use. However, the louder the sound is turned up, the more both speakers clang. The given quality is just enough to fill a room with sound adequately during a presentation, for example. You should make use of headphones or external speakers when playing a movie. The power consumption is all right for the given performance. 13-18 watts in idle mode and 54-74 watts during load are within the usual range, in view of the installed hardware. The HP ProBook's compact 90 watt power adapter is more than sufficiently sized for this. We use various scenarios of the tool, BatteryEater Pro, to determine the HP ProBook 6560b-LG658EA's proportional battery life (6 cell, 55 Wh battery). Operation during load is simulated in the first run through, so the Classic test (maximum display brightness, high performance profile). The HP ProBook achieved a battery runtime of 59 minutes here. The battery achieved a runtime of 304 minutes in the Reader's test that runs in idle with all available energy saving options (min. display brightness). That is equivalent to 5 hours and 4 minutes. We could assess 289 minutes (4:49 h) for surfing via WLAN on the go. If you like to watch DVDs on the go, you can enjoy movies with a maximum runtime of 2 hours and 4 minutes with the HP ProBook. That should actually be enough to watch every normal-length movie up to its end. Unfortunately, over-length movies have to be watched in portions, or you could opt for upgrading the battery right away. HP offers a whole range of options in this regard. The HP ProBook 6560b-LG658EA's battery needed 112 minutes to recharge. 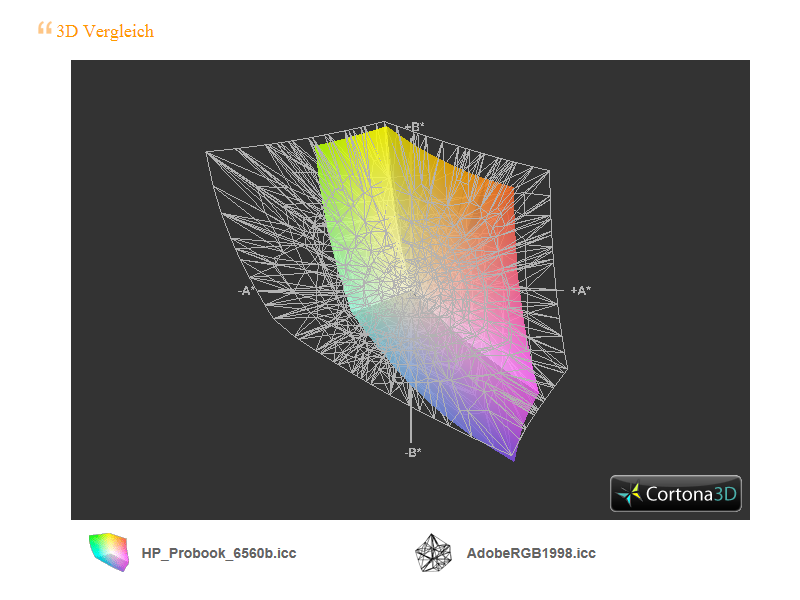 The HP ProBook 6560-LG658EA (almost) convinces in every way. The aluminum case that has been additionally reinforced with magnesium isn't only an optical treat. The notebook is very robust and can put up with a lot during daily use. This is also what it's been designed for. 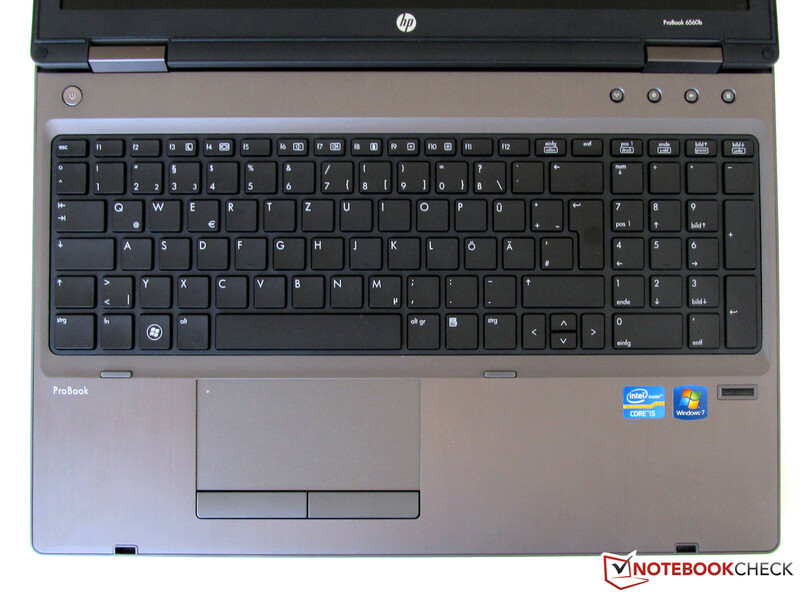 The HP ProBook 6560-LG658EA is very resistant against environmental influences and the keyboard can also endure a lot. It even (hopefully) forgives a light rain shower or accidental spill. The platinum-like surfacedoesn't like fingerprints, though. In line with the motto: If you love your notebook, you'll always be cleaning it. The 15.6 inch HD+ display, with a resolution of clearly arranged 1600x900 pixels is very rich in contrast and renders saturated colors. They however are lost quickly when the laptop is to be used outdoors and in direct sunlight. You have to pay attention to how you set up the display when working with the ProBook at the office. The possible viewing angles are only on an average level. The installed hardware is perfect for the notebook. A fast dual core CPU (Core i5 2520M) from Intel, with a base clock of 2.5 GHz (up to 3.2 GHz in Turbo Boost mode), and an AMD Radeon HD 6470M graphics card model hardly leave anything to be desired in the business field. The HP ProBook also has a lot to offer in terms of connectivity. 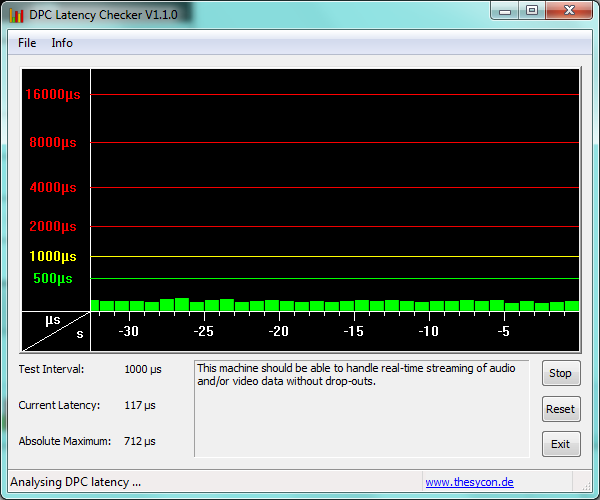 Besides WLAN(802.11 b/g/n) and Bluetooth 2.1 EDR, a 56k modem and a HSPA+ module(WWAN) is also installed (in our model). You can work for at least good 5 hours without a power socket. However, the battery didn't even last for an hour during load. Fortunately, HP offers dozens of upgrade options, even for the battery. 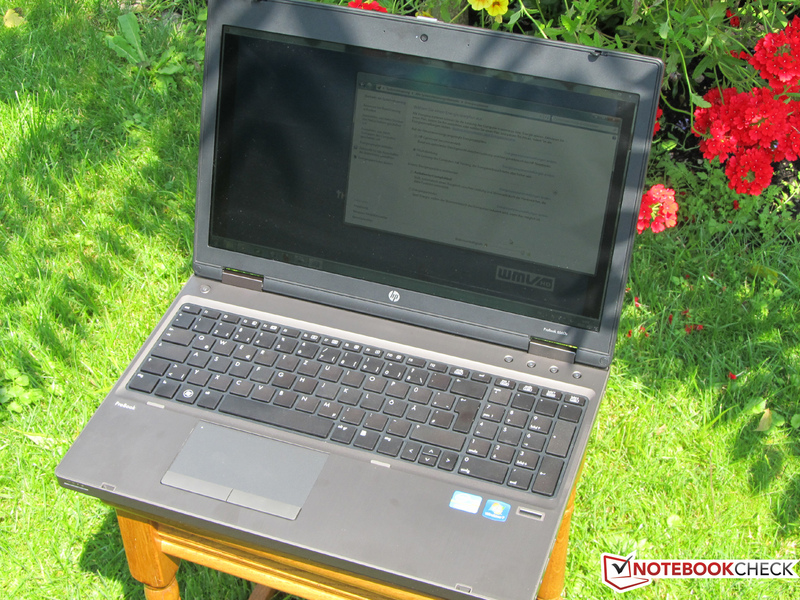 If you disregard the heavy metal notebook's weight of 2900 grams, the HP ProBook 6560-LG658EA is a good and mobile workhorse that does its work at the office and on the road fast and (mostly) quietly. The price of around 900 euros sounds very enticing for the almost perfect notebook, but it only has a basic warranty of 12 months.